Via our friends at DC Editions, we found a great video about Platinum Prints and how they're made. Check out our recommended papers for this process. For over 20 years, the Vogel Bindery has been crafting books entirely by hand using traditional techniques virtually unchanged for 300 years. ABC news recently aired a feature on Paul Vogel and his gorgeous work. Not ones to be outdone, the NY Post also featured Paul. Here's an excerpt, you can read the full article here. You can’t judge a book by its cover. But you certainly can judge the cover. And if you’re looking for the highest craftsmanship in custom bookbinding, then meet Paul Vogel. It’s a niche trade, for sure. But for nearly 30 years, the master binder and restorer has applied an artist’s touch to cloth, leather and gold leaf to craft exquisite covers on books displayed at the White House, Library of Congress and the Morgan Library. He’s also worked for celebrity clients from Oprah and Ralph Lauren to Henry Kissinger. 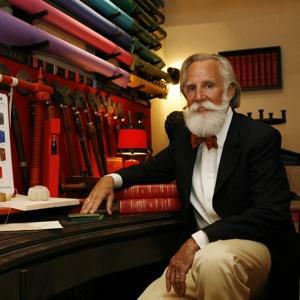 Originally from New Jersey, Vogel opened his first bindery on 26th Street in Manhattan in the early ’80s before relocating his workshop to East Hampton. With help from artist wife Abigail, the 60-year-old Vogel estimates he’s bound maybe 11,000 books to date, and currently has more than 100 regular clients.